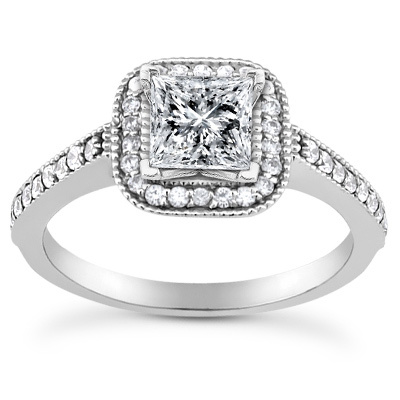 If she is truly the one, she will be sure to say, "I do!" when she beholds this beautiful, unique 3/4 Carat princess-cut halo diamond engagement ring set with a 0.50 carat princess-cut diamond center stone and 0.33 carats of surrounding diamonds for a total of 0.88 carats of diamonds set in a 14k white gold ring. 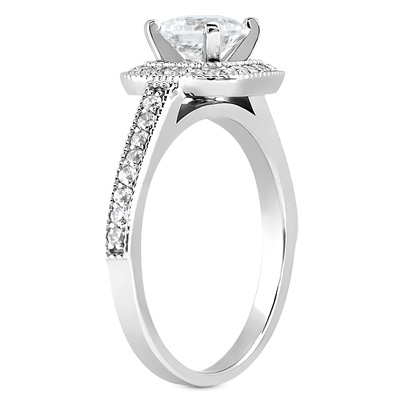 Also available with 0.75 carat or 1 carat center stone, shown below. Apples of Gold Jewelry guarantees the 3/4 Carat Princess-Cut Halo Diamond Engagement Ring to be of high quality and an authentic engagement ring with real diamonds, as described above.